Zhangye blabla - 6 Counties: The Cities Ganzhou District, then from north to south Gaotai County, Linze County, Sunan Yugur Autonomous County, Minle County, Shandan County with Shandan County bordering in the east and south to (Minqin County of) Wuwei Prefecture. The Gaotai Martyrs Monument is not part of Zhangye Town, but found in Gaotai County of Zhangye City Prefecture, which is a small agricultural Town located some 80 kilometers to the North-West of Zhangye City along the Hei River and the Lanzhou-Urumqi Highway. It serves as the official site of commemoration for the so-called fifth army corps of the 4Th Red Workers and Peasants Army Detachment, which was sent to these regions in 1935 AD, only shortly after their arrival from the devastating "Long March". Due to various peculiar events, important political factors, the harassment by forces of the Muslim Warlords of the Region and a cold and harsh winter, half of the Army perished along the way to Gaotai, a hostile village with no food whatsoever. The remaining soldiers were cornered at the Town to make final stand and be defeated. Only handful of the army were to return, most escaping on foot through Qinghai Province or hiding in local villages. Read the Complete information on the Monument: "Gaotai 5Th Red Army Corps Martyrs Monument". A Last popular place to visit at Zhangye is its famous Horse Farm, the largest Army Horse Breeding Farm in China. Officially known as Shandan Army Horse Ranch, the Farm is not located at Zhangye City but can be found due South-West of Zhangye, and 55 kilometers south of the historical Town of Shandan which itself lies just 66 kilometers due East of Zhangye along Highway No.312 (Lanzhou-Urumqi Highway). There the Farm lies situated in Damayin pastureland underneath Yanzhi Mountain at the Height of 2600 meters. The Shandan Ranch has a history of over 2000 years, with historical documents mentioning horse raising at the Shandan Farm as early as during the Era of the Sui Dynasty (581 AD - 618 AD). The wider regions however were already well known for their grasslands and sturdy horses during the Han Dynasty (206 BC - 220 AD). In fact, Shandan Farm is in truth a living relic of the Silk Road. That being, it was here in the Hexi Corridor that the first strong Horses discovered by envoy Zhang Qian in Dayuan (大宛 or 'Great Yuan', literally 'Great Ionians' thought to have been in the Ferghana Valley in Uzbekistan) and Wushun, homelands of nomadic tribes, were interbred with horse species from Central China leading to stronger and improved horses available for the Cavalry of the Imperial Armies. For historical interest: Dayuan People were essentially Greeks who were the descendants of the Greek colonists that settled in these regions during and just after the Great Conquests of Asia led by Alexander the Great (356 BC–323 BC). During this conquest the Ferghana Valley regions were the most eastern lands reached by the Greeks, and those who stayed first settled in the area around the year 329 BC. Their nation, which had a Capital City named Alexandria Eschate subsequently prospered within the Hellenistic realm of the Seleucids and Greco-Bactrians, until new migrations of nomdaic tribes within Central and East-Asia isolated their lands. The Ferghana eventually fell to the numerous migrating Yuezhi People from Mongolian Regions in and around 160 BC. Historians and others have been suggested that the name "Yuan" given to the Greeks by the Chinese of the Han Era was simply a transliteration of the words “Yona”, or “Yavana”, used throughout antiquity in Asia to designate Greeks (“Ionians”). At any rate, the Greeks were found by the Han Imperial Envoy Zhang Qian, who was the earliest Chinese visitor to make it as far West as these regions. Zhang Qian only passed through on his way to visit the Da Yuezhi or 'Great Yuezhi' in about the year 127-126 BC. However, he had stayed around long enough to identify the military significance of the strong horses kept by the Greeks. Not much later special diplomatic missions would be organized to establish friendship with the Dayuan and get hold of some horses. Later during the Tang Dynasty Era (618 AD -907 AD) Persian horses were brought from the West to interbreed with Tang Dynasty Chinese horses "of strength and vivacious beauty". The horses were of such importance to the Chinese Empire that the Shandan Farm and its animals were especially mentioned in the Tang Dynasty Records, known as the "New History of the Tang Dynasty" (Xin Tang Shu), where it is listed in the texts of the military sections. It were the horses from Shandan and the wider hexi Corridor that inspired the many depcitions of flying or galloping horses that were unearthed at archeological sites along the length of the Hexi Corridor. Ever since the earliest existence of the ancient Silk Road Shandan Horses have served a crucial function in the armies of many Chinese Dynasties and thus the Shandan Horse Farm is famous in China. However, even though the Farm is legendary Mount Yanzhi towering over the grasslands with a top op 3987 Meters may be even more famous. Interestingly, famous among the local population this is the location where abundant rhubarbs grow. The rhubarbs from the base of Mount Yanzhi are plants which for centuries have been used as an ingredient for herbal medicines in these regions, and in the west (In Europe) their abundant growth here was first announced by Marco Polo. The Shandan Horse farm occupies a large area of grasslands on which the horses are allowed to graze near freely. In fact, the Ranch is so large that it straddles no less than 6 counties of Zhangye Prefecture and occupies over 200.000 hectares of Land. With it superlarge size, today it takes the second position in the world and the largest in Asia. Although the modern Chinese Army has been largely mechanized, reducing the need for animals there are still about 10,000 army horses herded there. Apart from these, the Farm raises Mules and Donkeys, as well as Yaks - much needed for the Army to use in their operations in mountainous area's such as in Kashmir and Tibet to the West and South-West. The Mules and Horses of Shandan were put to good use in the aftermath of the Sichuan Earthquakes in 2008, when roads blocked and rivers shifted, transport of vital medicines and materials could sometimes only be done with the help of animals. The main administrative building of the ranch lies right underneath Yanzhi Mountain. Visitors are sparse so booking ahead is a good idea. Visitors can enjoy the wide open spaces of Damayin Grasslands, the fantastic sight of Mount Yanzhi and rent horses and/or get a guided tour of the facilities by jeep or on horseback. Due to its height be aware: bring warm clothing when visiting in spring or autumn. Things can get really nippy at the Ranch. Not to mention the sometimes spectacular high snows of winter. Zhangye is not merely known for its spectacular historic landmarks but also for its unique landscape and scenery. Bordered by the mighty Qilian Shan mountain range with tops going over 5500 meters, Zhangye lies surrounded by surprising green lands. Where horses graze on the Damaiyin Pasture Lands underneath, Egrets fly over the Heihe wetlands of Gaotai County in Zhangye City. The Heihe wetlands of Zhangye surround the Town and lie on an important migration route and its abundant waters in otherwise arid regions provide an essential stop-over on the way across the continent. Much has been done by the local People and Provincial Authorities to preserve the natural variety of this special place leading to a recent increase of the Bird Population. Many come to Zhangye just to see them and enjoy their wild beauty! More wetlands of the Hei River are located near Jinta and County, North of Jiuquan and due West of the Hei River itself. Here at an altitude of 1,000 to 1,924 meters lies the Jinta Nature Reserve, a restored wetlands area with a surface area of 1,800,000 hectares. The main terrain type of this region is Eurasian steppe and desert, however amidst the barren desert wildlife thrives in various ponds and extensive marsh area's. The north edge of this Nature reserve is formed by Tangke-Hongxing Road, the south edge is formed by Tangke-Ruoergai county road, the east edge is formed by Ruoergai-Diebu National Road (No.213), and the Che’niya River, the Hei River and Tangke-hongxing National Road (No.213) together form the western edge of the Jinta Nature reserve. The boundary of the wetland is the same as the boundary of current nature reserve. 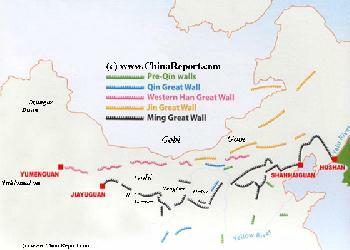 Read More: "Landmarks, Monuments and Hotspots of Jiuquan". Geologically, the Danxia Landforms belong to red terrestrial clastic rock landform, which is characterized by its red and white banded cliffs with sharp edges and, within China, is only found in Qinghai Province and Gansu Province. Find this type of "painted desert" made up of eroded rocks and hills mainly concentrated in Linze and Sunan Counties near the city of Zhangye where they occupy some 300 square kilometers of land, the largest such area within the Nation. The section near Kangle village in Sunan County is known to have the best and most esthethically evolved landforms and is thus one of the favorite spots for a visit. Entirely desolate and devout of water the Danxia Landforms are no place to go hiking without a proper guide and/or navigation. Do not get lost or stray, or perhaps pay the ultimate penalty. One of the Most Famous Landmarks of the Silk Road can be found near Zhangye. Visitors first have to travel due South West of Town to Sunan Town, which is about 65 kilometers from Zhangye. Not far from there is the location of The Grottoes of the Matisi Temple Complex, which consists of various Temples and the Caves with their Deities and Murals. Set within the beautiful surroundings of the Green foothills of the Qilian Mountains, and along a cool and refreshing river, Mati Si offers a unique and amazing scenery. Read a Full Introduction and Directions to the MaTi Si Caves, the Horses Hoof Temple: "Mati Si - Horses Hoof Temple (1) Introduction". During the Ming Dynasty period, starting immediatly after the last Mongol Armies were driven out of the Hexi Corridor through the Jiayu Pass, Zhangye was an important garrison town for soldiers guarding the Great Wall. Construction began on the Great Wall Fortress at Jiayuguan further West in the Year 1372 AD, after which the entire length of the Great Wall of China was reinforced, redesigned and strengthened. It is estimated that well over a million soldiers guarded the great wall, with many more needed to support them and their hungry mouths. Today the Great Wall near Zhangye is crumbling and found mostly to the south of the town. Follow the road South-Eastward from Zhangye to Wuwei to get a good impression of today's remnants. Although the Walls encircling the Ming Era Capital at Beijing were almost exclusively built of bricks or local rocks, which made them near impenetrable and standing today, the construction in these western regions were done with often less solid materials. The builders used whatever materials were locally available, and thus in these parts, the Wall were often made of Mud and Reeds. crumbling line of mud ramparts. Initially it runs to the north of the road, until, quite dramatically, the road suddenly cuts right through a hole in the Wall and continues on the other side. Every now and then a crumpling watchtower or beacon dots the landscape in the vicinity. Lying 12.5 kilometers (7.77 miles) northwest of Zhangye City, the Relics of Heishui Kingdom belongs to the Neolithic Age. Covering an area of roughly four square kilometers (988.4 acres), there were many Tombs dating to the Han Dynasty in this area. Unfortunately, most of the tombs were buried by sand storms that are increasingly plaguing the region. Don't loose your head out there ! Wandering in the Zhangye Forest Park, one sees boundless mountains and successive dunes in the distance and enjoys the sunshine on the beach. In summer, Hongyashan Reservoir is an ideal place to escape the heat. All of these make a trip to Zhangye unforgettable. 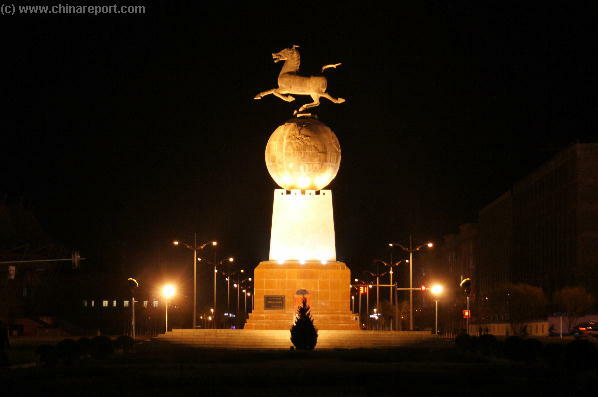 Large Statue of a Chinese Horse running over a Globe, one of the recent Monuments showing the importance of the Silk Road, History and Tourism to the City of JiaYuGuan. Go to Linze County and the village of Banqiao on the Hei River to locate the last remaining remnants of Zhaowu Town, millenia ago the Capital City of the Nomadic Rouzhi Tribe. Before the arrival of the Han Dynasty Armies in the West descendants of the Rouzhi people populated this middle section of the Hexi Corridor along the Hei River, making grateful use of the green oasis and grasslands underneath the mountains. Nine Kingdoms were formed around seperate Oasis along the Hexi Corridor, populated by shrewd trading people who, due to their strategic location were able to dominate trade between these regions and central Asia. Although the Rouzhi prospered and multiplied, they were eventually driven out by the Xiongnu People, and emigrated across the Pamir mountains to the West. Although Zhaowu has been abandonned since some scattered remains exist. Todays Zhaowu village near Banqiao is built on what were once the suburbs of Zhaowu City of the Rouzhi and is situated on the South Bank of the River. The ancient Ruins lie on the Northern Bank.